What is the best time to visit Iceland? What are the Icelandic seasons like? What weather is it? When can we see the aurora borealis? What is the puffin season? And that of the midnight sun? These are some of the main questions we receive. But the one that comes back most often relates to the best time of the year to visit Iceland, a question to which it is not easy to answer as the nature, the wild life and the Icelandic climate are unpredictable. 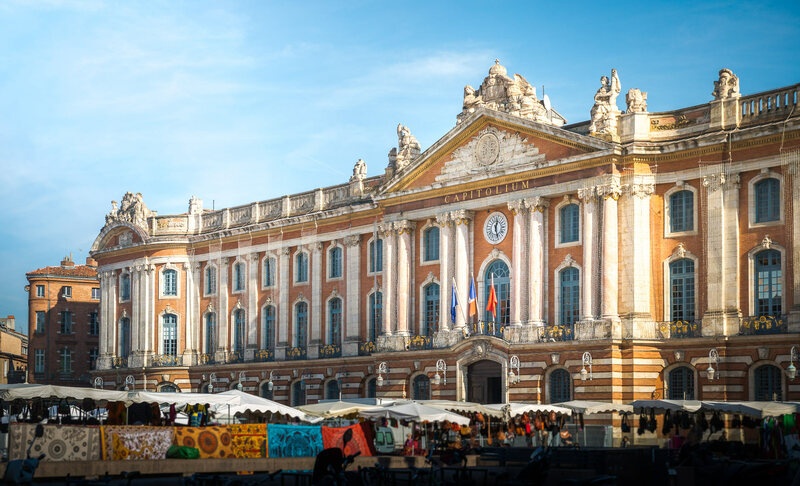 So we decided to gather as much information as possible about climate and season-dependent tourist sites in one article! 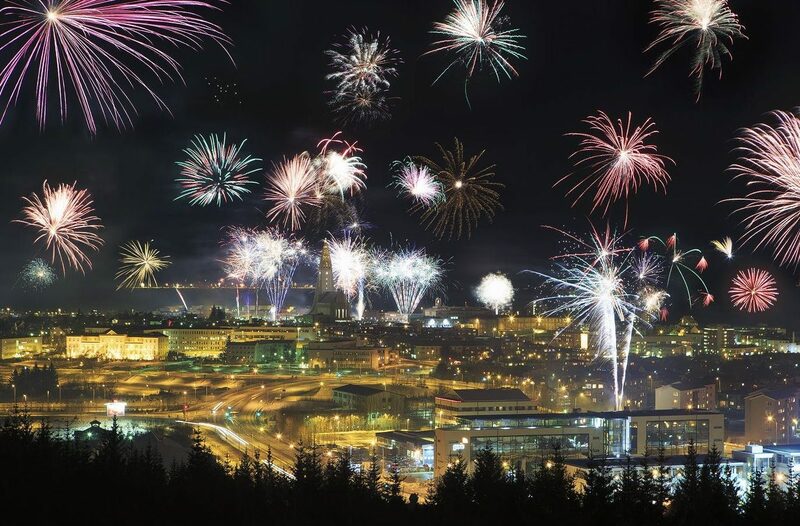 According to YOU, what is the best time of the year to go to Iceland? Iceland has four seasons, although we do not always notice, because the weather changes constantly. When you are in Iceland, you will probably hear the saying, “If you do not like the weather, wait 5 minutes”. Many people think of Iceland as a country constantly caught in the ice and the cold, but they are mistaken. 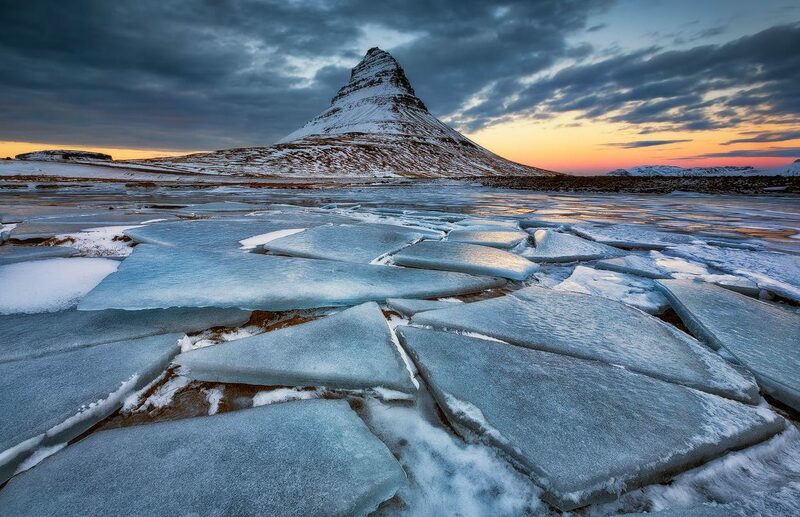 In fact, Iceland enjoys a much milder climate than its name suggests (which literally means “ice-land”). This is partly explained by the action of the Gulf Stream which circulates south and west of the country, and brings with it a heat straight from the Caribbean! Unfortunately, this also means that the temperate air masses of the Atlantic come to meet the cold air masses of the Arctic from the north, causing abrupt and frequent changes of weather. This also explains why there is a lot of wind and storms in the country, and that the South is rainier than the North. But this is not the only source of warmth for Iceland, as the country is just above one of the hottest spots on Earth. 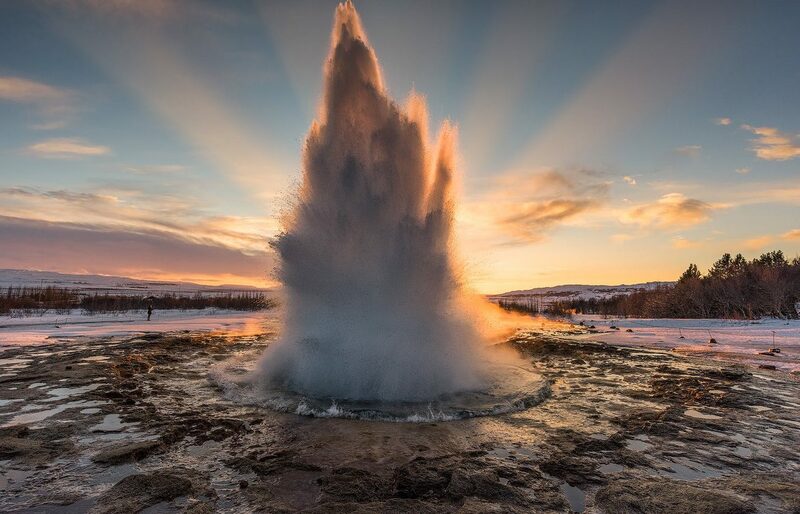 Iceland has amazing geothermal activity from many hot springs , geysers, mud pools, volcanoes and sometimes earthquakes. It is indeed one of the few places in the world where we can see two tectonic plates on the surface of the Earth, since everywhere else or almost, they come into contact only under the sea. Concretely, Iceland is divided in two by the Eurasian plate on one side and the North American plate on the other, and the dividing line that passes in the middle of the country is particularly visible in the Thingvellir National Park, where one can even practice diving ( snorkeling or with bottles ) between the two continents. 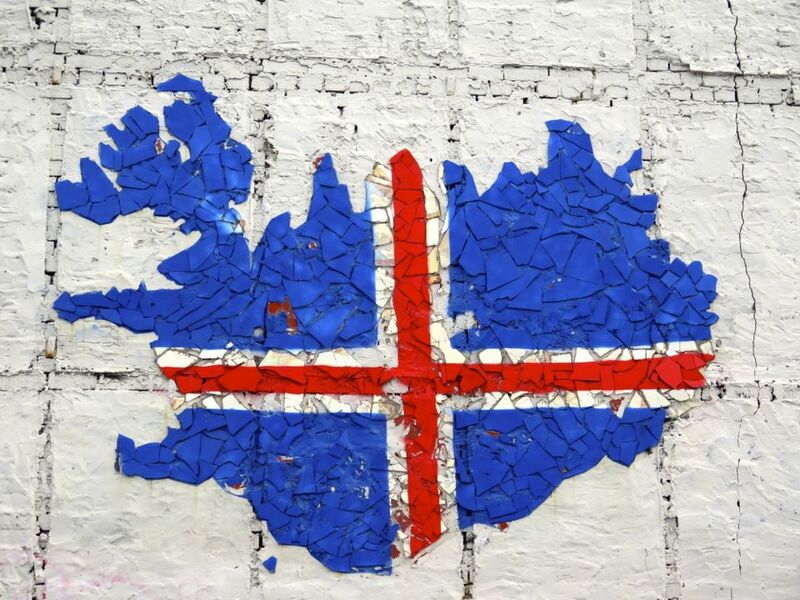 In a few billion years, Iceland will be cut in half. Do not be deterred by volcanic activity or earthquakes, because as soon as a volcano erupts, far from fleeing people, it attracts the curious around him. As for earthquakes, they are of low intensity and very rare. The volcanic eruptions or earthquakes have never caused major damage apart from the destruction of some crops a few centuries back, and the suspension of some of the air traffic a few years ago because of a cloud of ashes. 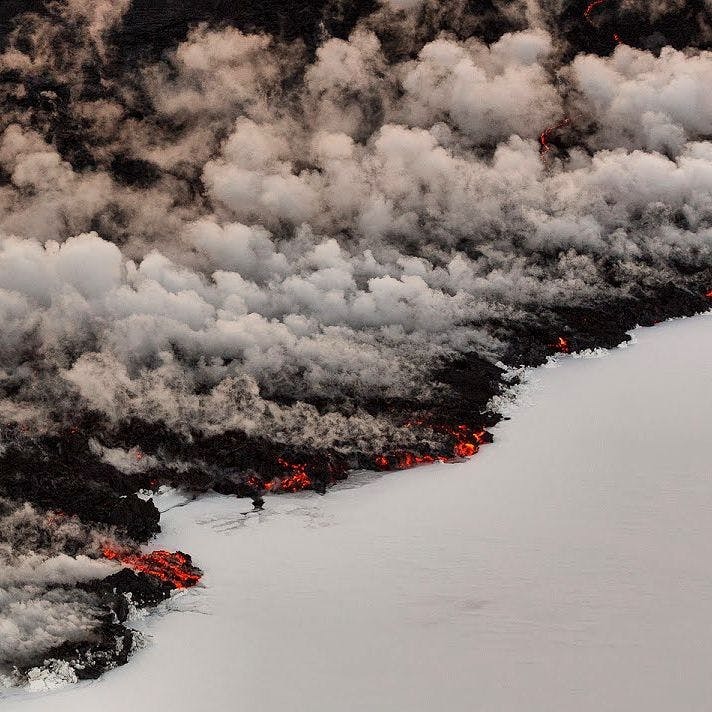 And then … volcanic eruptions are simply extraordinary beauty, and to attend one of them is to return to the humility that must be ours before the forces of nature! 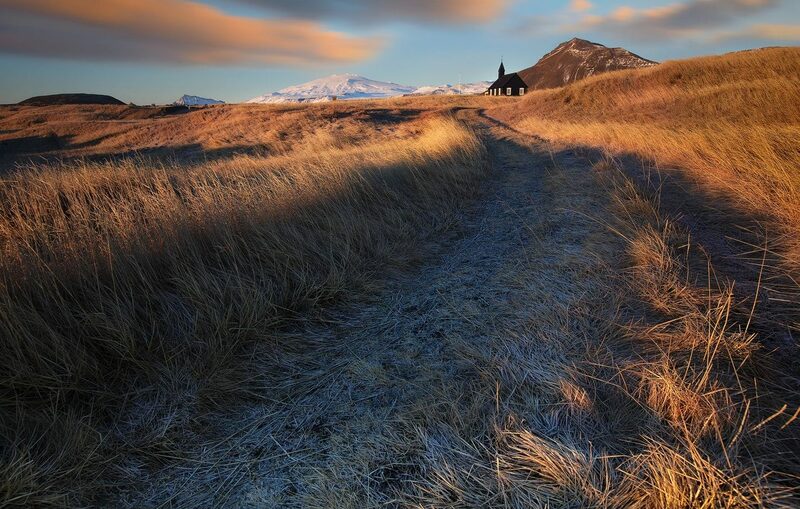 The average temperature in Reykjavik is 1-2 ° C (33-35 ° F) in winter and 12 ° C (54 ° F) in summer. In winter, temperatures can drop to -10 ° C (14 ° F) and rise to 10 ° C (50 ° F). In summer, they can go down to 0 ° C (32 ° F). Icelandic winters are not as cold as in Canada or Russia – or even in New York or the Baltic states. In summer, however, there are never hot days, although it can sometimes be quite hot. The country’s hottest temperature was 30.5 ° C (86.9 ° F) in 1939. The temperatures are quite mild throughout the year and there is no dramatic change in temperatures between summer and winter, as in New York for example. On the other hand, this “temperate” climate is totally unpredictable. You can wake up on a beautiful sunny day and, as you get dressed, look up and discover a blizzard is raging outside. Or, you can be driving in a valley under a beautiful blue sky, pass a hill and suddenly find yourself in fog and rain. There is also a significant change in temperature depending on your geographical location: if you are in a valley or a plain or if you have wind: the feeling may be colder than the temperature indicated on the thermometer. 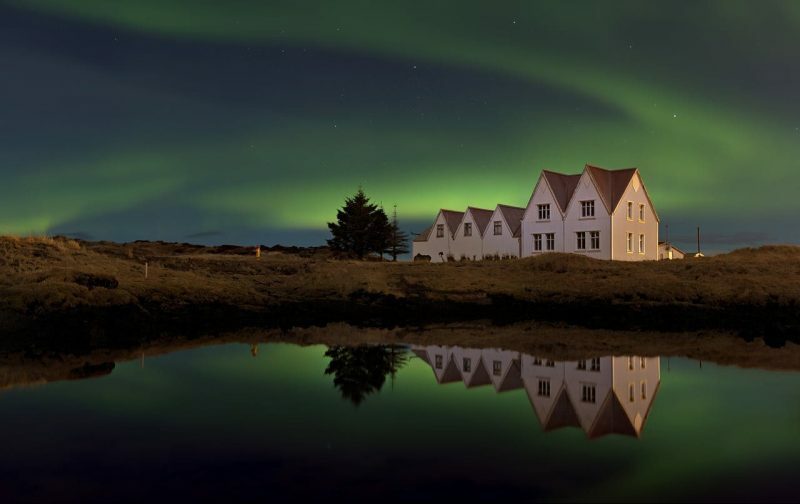 Icelanders are used to the constant change of weather, and if you book an excursion that must be canceled due to bad weather, either you will be fully refunded or the date of your departure will be postponed. From our point of view, each season has something unique. 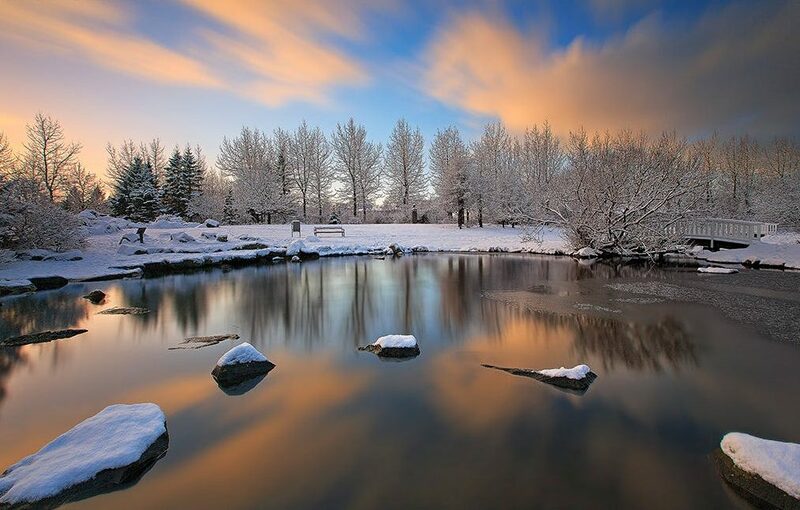 You can find out about the different seasons here to get an idea of ​​what is the best time of the year to visit Iceland! It is in summer that Iceland welcomes the most visitors. 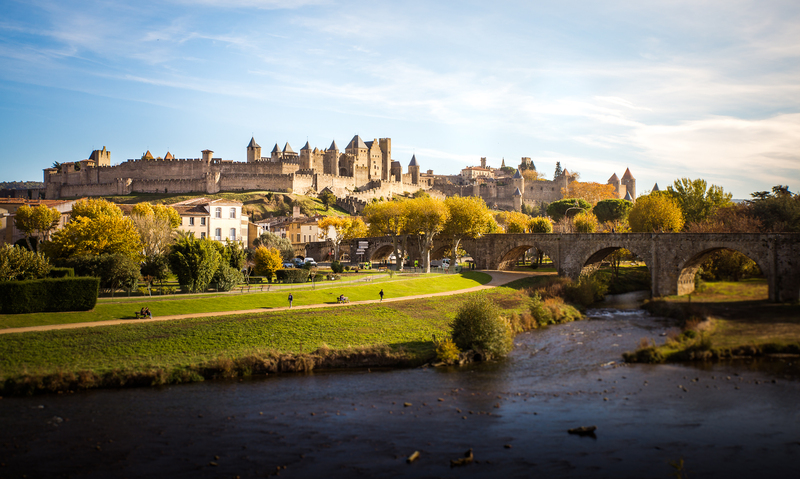 The weather is milder, the days are longer and it is true that it is a fantastic season to visit the country. 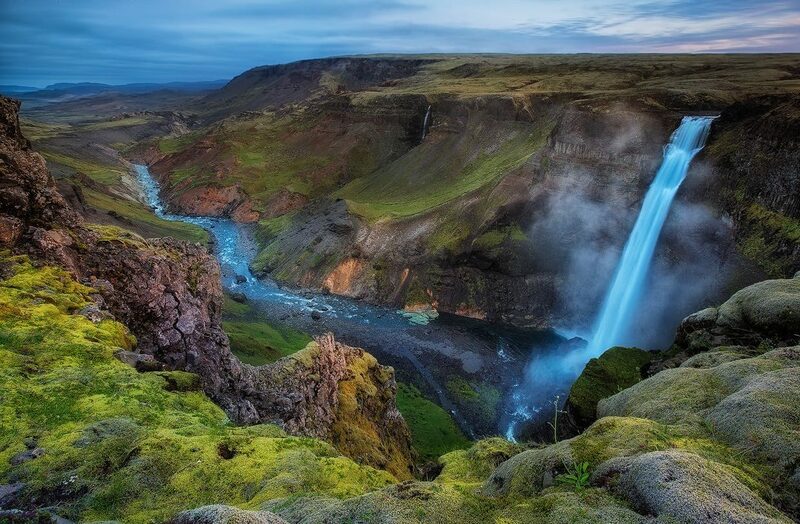 If this is the first time you visit Iceland, we strongly advise you to go there in summer. However, if it is the second or third time that you are going to Iceland, we recommend you try another season. Thus, in “off-season”, your accommodation costs will be reduced (with the possible exception of Christmas and New Year!) And you will enjoy very different landscapes compared to summer. In Iceland, spring is the months of April and May. 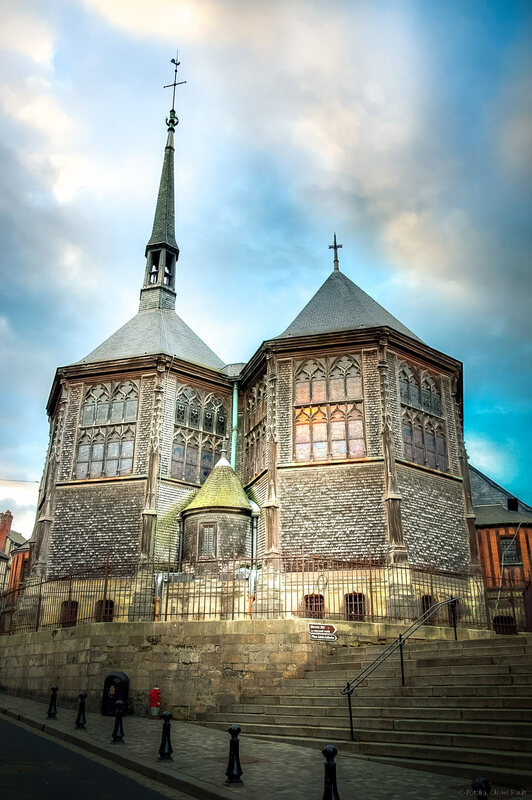 Every first Thursday after 18 April is a holiday and marks the first day of the summer for Icelanders . It is not uncommon for it to snow on this day. But it is not the first day of the summer that officially, because in reality we should rather consider that it is the first day of spring. 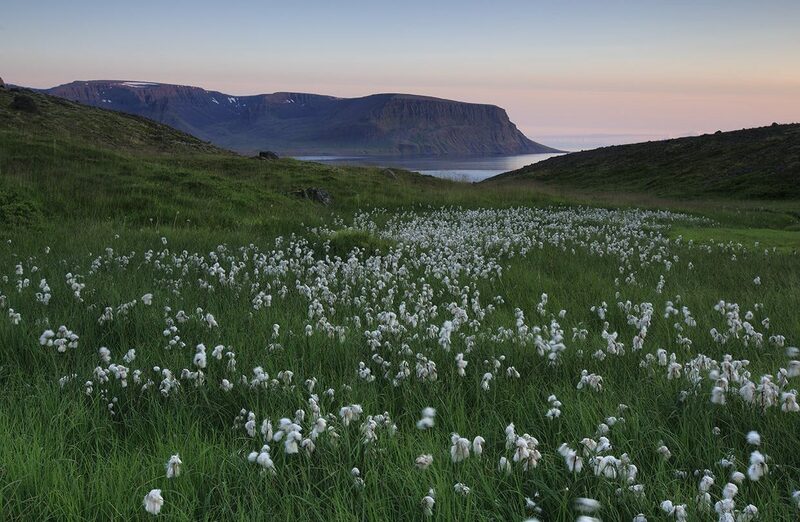 During the months of April and May, the snow can fall from time to time on Iceland, but in general, it melts in the mountains and Highlands, and has already almost disappeared in Reykjavik and on the coast where the vegetation starts to bloom. This is also the time of year when migratory birds, such as the famous puffin, begin to appear in Iceland. 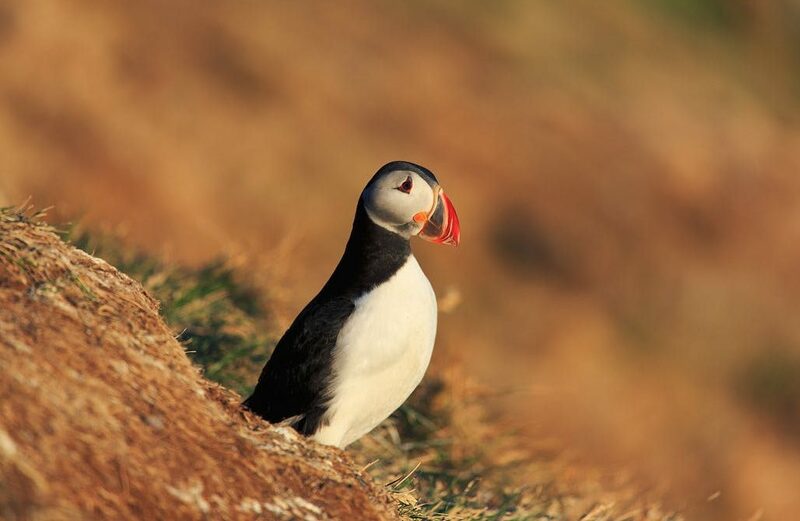 The first puffins appear in April and remain in the country until September. But it is another bird, the Lóa or Golden Plover, which is supposed to announce the spring, and it is towards the end of March that one can see the first of them. The spring weather in Reykjavik can alternate between snowfall (melted or not), rain and sunshine. Temperatures range from 0 ° to 10 ° C. Spring can be quite humid in the southern half of the country, and drier (but also colder) as you go north (towards Akureyri). In the Icelandic highlands, the temperature can be 10 ° C below the coast. This explains why they are closed to traffic. The colors of nature begin to appear, the grasses are not yet very tall or green, but the buds of the trees are about to hatch. We can then see spring flowers like crocus or Easter lilies raise their heads in the gardens of the inhabitants. We can even see other spring species blooming on the trees. In general, once the winter has passed, people are full of enthusiasm and some excitement floats in the air at the thought that summer is about to begin. Spring is a good time for those wishing to travel to Iceland. Indeed, we can still hunt aurora borealis, the weather is quite lenient and high season has not started yet, so that tourists are fewer and more attractive prices. It will also be easier to find free accommodations and the season offers many excursions. 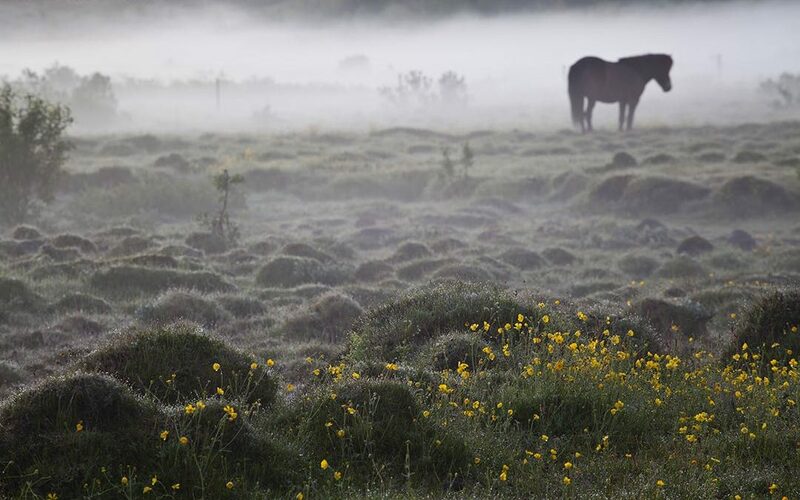 The Icelandic summer is considered to start in late May to early June and last until August. This is the period with the highest number of visitors to Iceland. It’s in summer that Iceland’s midnight sun comes in, meaning that the days are incredibly long – ideal for traveling. The days lengthen endlessly until the longest day of summer, around June 21st. After the summer solstice, the days begin to shorten, but only one or two minutes a day! The sunsets are transformed into sunrises in a masterful show that can last several hours. 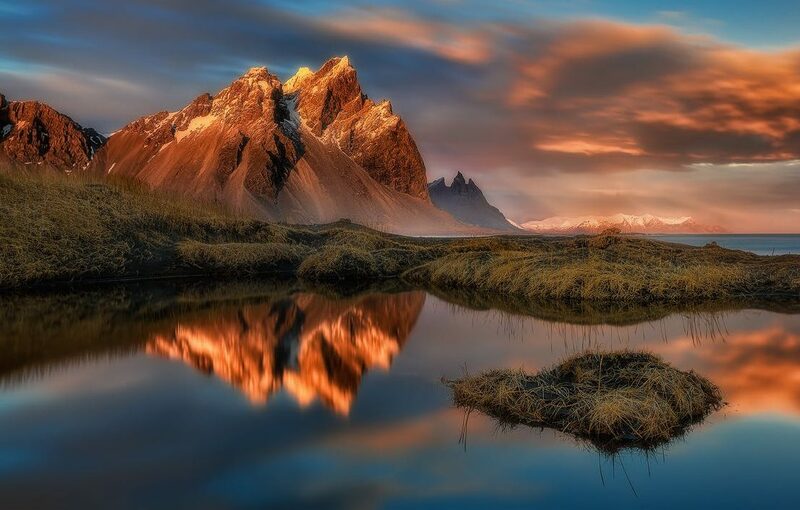 Iceland is a paradise for photographers who want to take snapshots of natural landscapes in the “magic hour”. 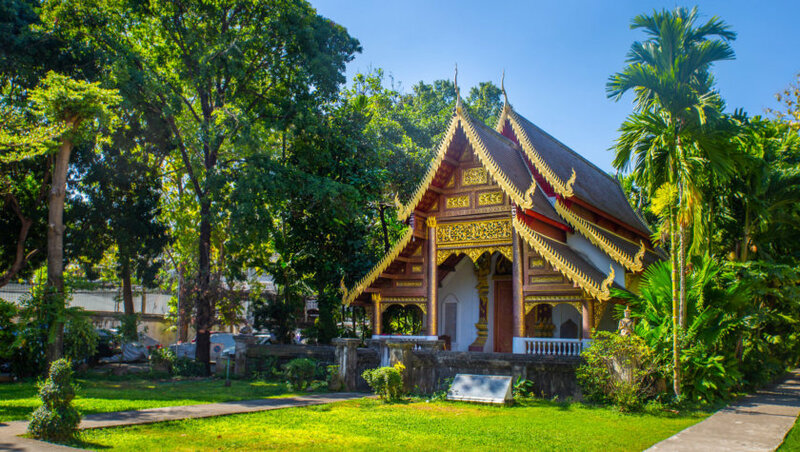 Most of the tours are in the summer, and the long days of this season will allow you to visit many sites such as mountains, glaciers, volcanoes and waterfalls, most of which will provide you with magnificent views. color contrasts. The weather can always be unpredictable and in some years, it may seem that the summer is reluctant to settle. The temperatures can go down to 5 ° C, but also reach 25 ° C! On average, they are maintained between 10 ° and 15 ° C. Summers are not as wet as spring, but it rains occasionally. The main factor of cold is the WindChill (or temperature felt), because there is a lot of wind in Iceland. 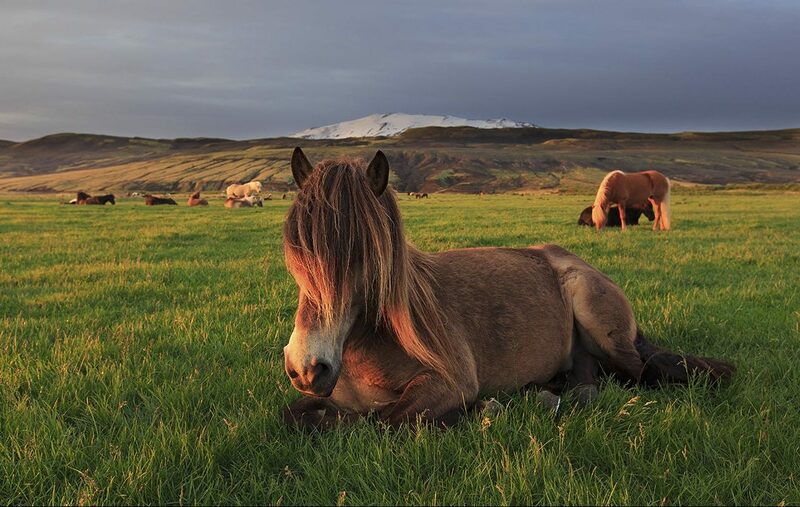 If you are lucky, you will have good weather and warmth, and you can spend beautiful summer days in Iceland. And if you are in an urban environment, you will see how cities come alive! Many bivouacs or music festivals flourish in Iceland during the summer, and a multitude of people choose to travel the country sleeping in their tent. Summer music festivals, in addition to countless smaller events, include the Secret Solstice Festival and the ATP festival. In summer, generally towards the end of June or beginning of July, the winter closure of certain Highland roads is closed. 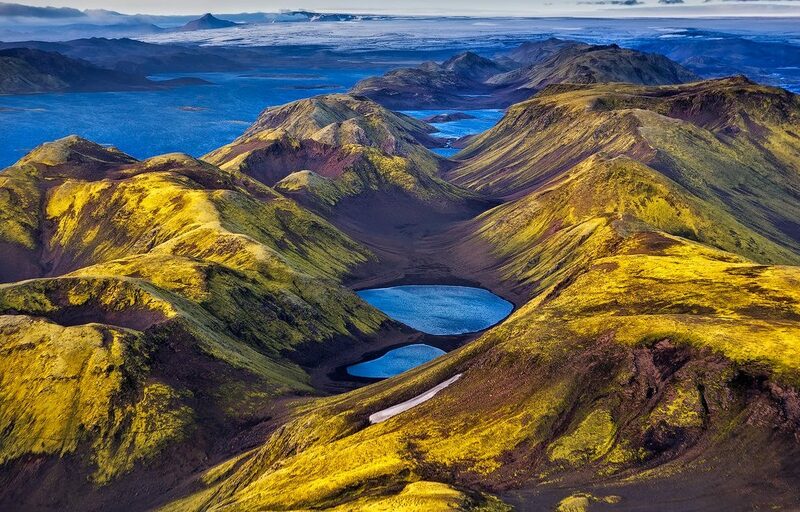 This is the only time of the year that gives you access to the famous Landmannalaugar Valley (unless you are going there as part of the Landmannalaugar Super Jeep Winter Tour ) and the Thórsmörk. So if you dream to go walking in the Icelandic highlands following the most famous hiking trails (the Laugavegurinn and the Fimmvörduháls), then July or early August will be the ideal time for you. 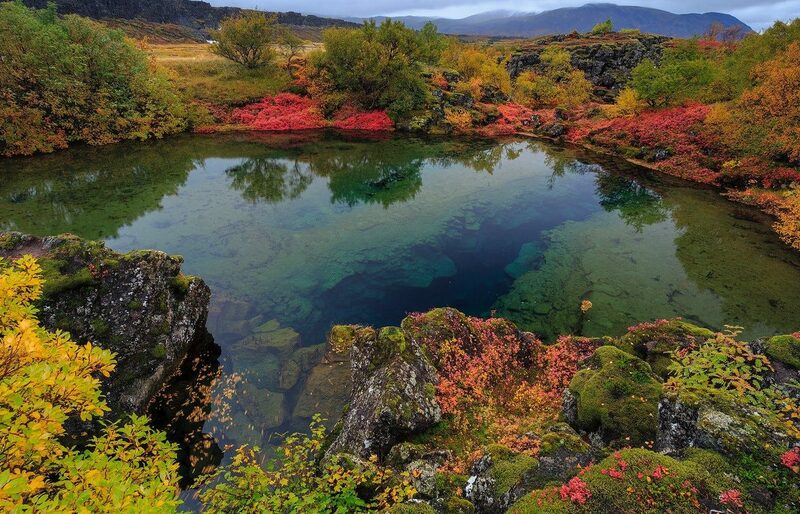 The Icelandic autumn starts at the end of August and lasts until the end of October or the beginning of November. Autumn is a great time to visit Iceland because the temperatures are still relatively warm at the end of August, even if it’s getting a little colder every day! In September and October, the prices of accommodation fall and you can enjoy the beautiful colors of the Icelandic autumn, and perhaps witness the first snowfall of the year and even see the northern lights! The only drawback is that there can be a lot of wind, humidity and sometimes cold weather. Autumnal temperatures are similar to those of spring, between 0 ° and 10 ° C, with the difference that there is more wind in autumn: leaves falling from trees are immediately carried here and there by the wind! That said, you will of course be able to enjoy beautiful days like the one seen in the photo above, taken in the Thingvellir National Park . 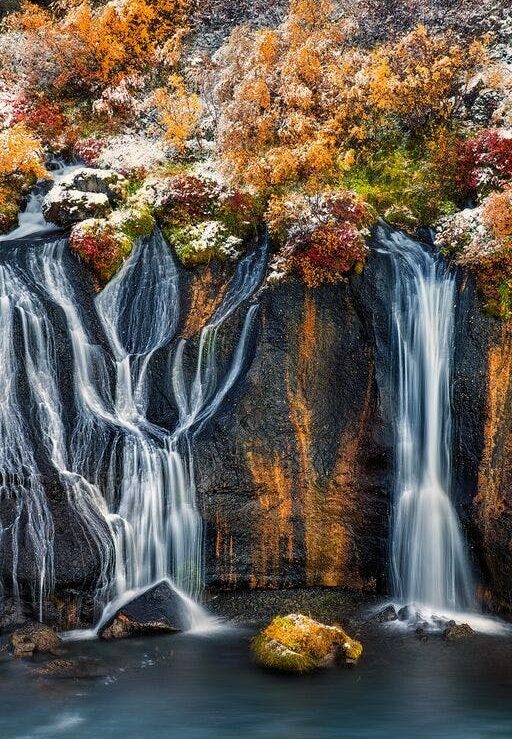 When a layer of fresh snow falls and unites with the colors of autumn, moss and lava, incredible color combinations are formed, as in this picture of the Hraunfossar (literally, ” the lava falls “). It is in autumn that the birds begin to leave and that some excursions like rafting or expeditions in the highlands cease to be proposed. On the other hand, it is the season of mushrooms and berry picking that opens in the countryside. In Iceland, you can pick up blueberries, crowberries and strawberries. You can also find currants, even if they are mainly present in the gardens of the inhabitants. And do not forget to observe the sky and stay on the lookout for the northern lights! In Iceland, winter is from November to March. These are the lightest months of the year, and the shortest day of the four seasons comes just before the Christmas holidays on December 21st. That day, there are only 4 or 5 hours of sun. Fortunately, the holiday season sparkles a thousand lights thanks to the Christmas decorations that adorn all gardens and streets! Winter in Iceland is best known for two things: Northern Lights and Natural Ice Caves . The ice caves are formed in summer under the Vatnajökull, the largest glacier in Europe, when the ice melts and large rivers begin to flow under the glacier. 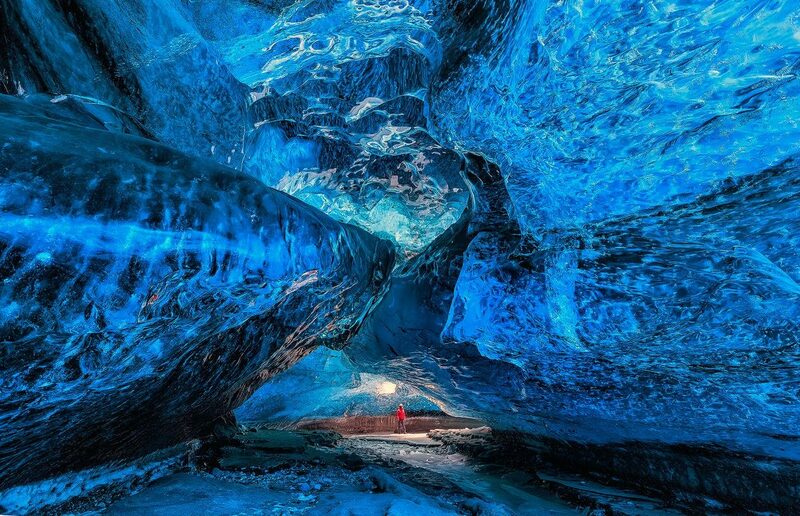 During the summer, you will not be able to visit the caves as they are busy with water currents, but when the temperature drops and the water becomes ice again, then Iceland has spectacular blue caves to explore. Icelandic glaciers are present all year round, and in summer, the contrast of colors they bring to the landscape is breathtaking, even if it is in winter that they are the most impressive. 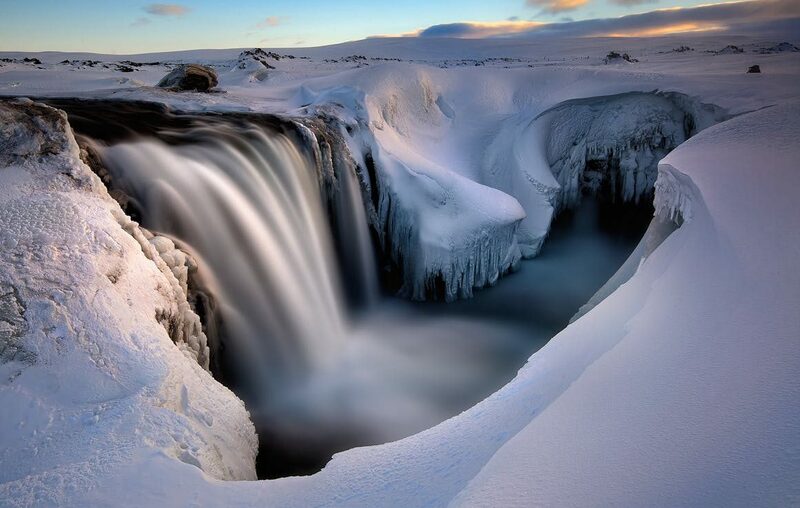 Contrary to popular belief, Iceland is not constantly snowy in winter, snow tends to appear, melt and appear again. So you can always enjoy the color contrasts and appreciate the titanic size of the glaciers. The more you go north, to Akureyri or Ísafjördur for example, the more snow you will find in abundance and low temperatures. Nothing very extreme however, but the temperature can go down to -10 ° C, and you can sometimes admire beautiful winter landscapes adorned with snow, ice and stalactites. The roads leading to the Highlands are closed in winter, but some glaciers are still accessible. These excursions are then dependent on time and visibility and can be canceled just a few hours before departure. In this case, you will be offered another excursion or a full refund. Thus, you have little chance of finding yourself at the top of a glacier in the middle of a raging snowstorm. But if it should happen, know that the temperature can go down to -15 ° or -20 ° C. So, the best advice we can give you is to bring with you many warm clothes, wool or polar preference. So, you can always add a garment or remove one! It is in September and March that the aurora borealis is best seen. It is not possible to see them in the middle of summer (June-July), because the aurora borealis are visible only at night. But in Iceland, this time of year is that of the midnight sun and the nights are clear. In August, the nights begin to darken and we can already see some aurora borealis. The “season” of the aurora is considered to be from September to March, when the darkness of the night lasts long enough. From time to time, the aurora borealis are particularly active, as in 2013 when the solar cycle was at its peak and spectacular appearances were observed. 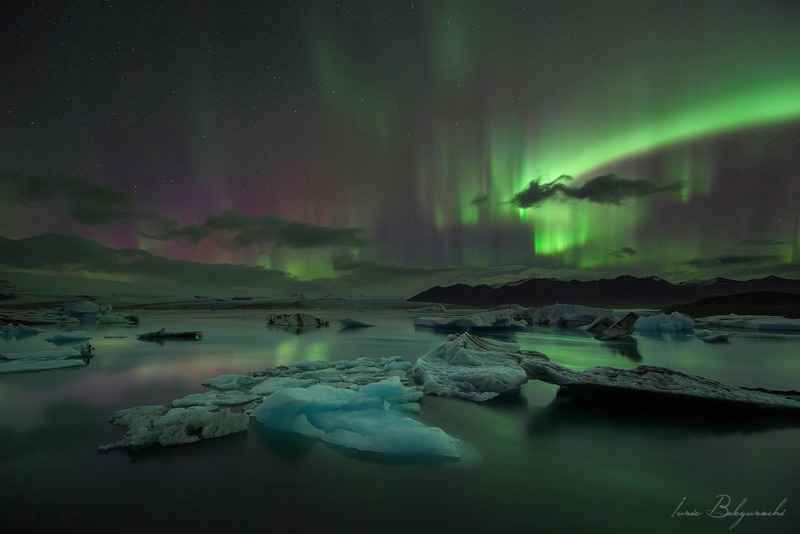 In 2012, the Met Office launched an Icelandic Aurora Borealis prediction service . It will provide you with a map of auroral intensity forecasts over time. Look at the white areas. They represent the regions where the sky is clear. It is here that the aurora borealis is best seen in natural darkness. The forecasts are not 100% reliable and some nights, while the scales announce a high intensity (7 out of 9 for example) you may not see anything, and conversely, when the activity is announced weak (1 or 2 on the scale of measurement) you may be able to admire a magnificent dawn. We leave here a series of articles on the Northern Lights, the best sites to find them, the way they are formed, their appearance, etc.